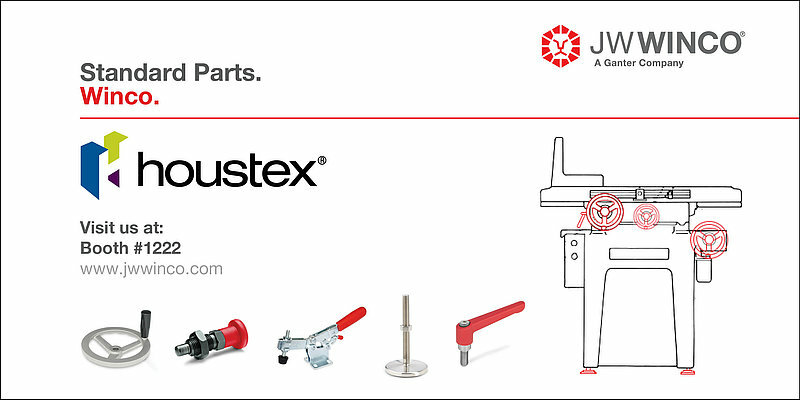 Houstex is the industry-leading southwest manufacturing trade show, JW Winco a manufacturer and distributor of standard parts will be displaying our products that are used on machines throughout the industries represented at the Houstex Show. Winco parts are the key components that cover holding, clamping, adjusting and positioning applications on the various machines manufactured such as, metalworking machines, automation machines, robotics, machine tools and fabricating equipment. Stop by JW Winco's booth #1222 and see our new GN 126 flat adjustable tension levers, GN 328 and GN 428 Cabinet “U” Handles and our GN 7237 stainless steel multiple-joint hinges. The GN 126 flat adjustable tension levers are characterized by their low height, manufactured from zinc die-cast and finished with a durable powder coating, and are an ideal choice whenever swiveling in a confined space is required or the lever has to be clamped in a particular position. By means of a recess on the underside of the lever, they reliably fit the hand of the user and guarantee pleasant actuation of the indexing mechanism. The sophisticated function of the serrated teeth enables smooth engagement and adjustment of the flat tension lever. Where required, the same zinc die-cast flat adjustable lever is also available with stainless steel components under the series of GN 126.1. The GN 126 and GN 126.1 have recently received the iF Design Award for outstanding design. JW Winco's GN 328 and GN 428 Cabinet "U" Handles Aluminum, with Tapped Holes or Through Holes and recognized for their stability, and ergonomic grip, these handles are made from solid aluminum and reflect the latest developments in industrial design. They have been recently awarded the iF DESIGN AWARD and the Red Dot Design Award. Solid drawn aluminum profiles are used for the new GN 428 machine handles, with two standard cross sections available in six lengths with anodized or powder-coated surfaces. Customers can choose the mounting connections to be on the front or back, with a threaded blind hole or standard through hole. Dimensions, bending geometry, coating types and coating colors are able to be customized. These features are also incorporated into the GN 328 "U" handles. Though smaller, these handles are similar in shape to the machine handles and made from die-cast aluminum. They are available in two sizes with a powder coated or polished surface. Invisible and highly mobile, GN 7237 stainless steel multiple-joint hinges from JW Winco are installed on the inside of flaps, hatches, hoods, trunks and doors to save space and to ensure protection against vandalism. The hinges have a maximum opening angle of 180° which provides optimal accessibility for bus luggage compartment doors, for example. Use of this hinge type leaves housing exteriors free of attachments that do not match the design or that should be avoided entirely in the interests of fast and easy cleaning. The multiple-joint hinge assembly is stainless steel, has two angle brackets that are used to mount the hinge to a housing or a door and has an intervening 7-speed, clearance-free, self-lubricated joint mechanism. As a result of the joint mechanism’s movement, which was designed by simulation software, when opening, for example, a compartment door flap is first slightly lifted and then swung up by 180°. Make sure to visit JW Winco at the Houstex show in Houston, Texas booth #1222, February 26th – 27th to see our products mentioned above and our full range of standard parts!